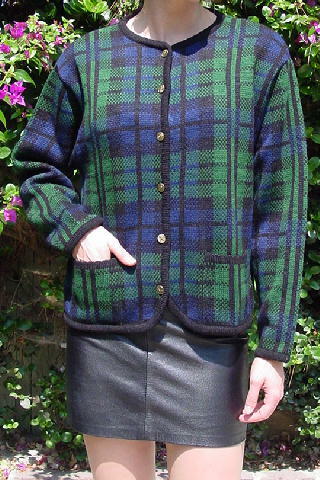 This plaid Tally Ho jacket is in black, dark blue, and grass green. It's 100% acrylic, has a jewel neckline, and long sleeves. There are six gold-tone buttons down the front with an elevated horse and carriage on each, and two lower open front pockets. 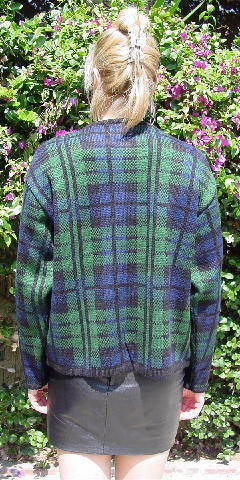 It has 1/2" black ribbing around the sleeves, neckline, front, and bottom. It's a nice weave pattern.